Plot: After 18 years in prison, Viktor Khadem (Don Hany) is a man who has almost given up on life. 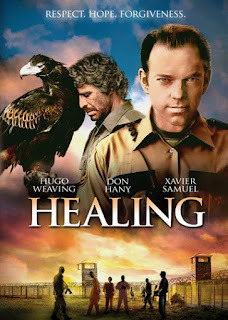 For his final months incarcerated, he is transferred to a low-security prison where Senior Officer Matt Perry (Hugo Weaving) has established a unique program to rehabilitate broken men by assigning them as caretakers for injured eagles, falcons and owls. Against all odds, the officer takes a special liking to Viktor and introduces him to Yasmine, a majestic, temperamental wedge-tailed eagle. If these wild souls can tame one another, anything is possible. Inspired by a true story, HEALING is a powerful, moving tale of redemption, the discovery of hope and the mending of the spirit. Healing is a wonderful drama, th was an inspiring story that leads the viewer down a dramatic reality that is both, hardened and touching. Viktor is your main character, he is getting over a lengthy prison term. In his final days of his term, he is sent to a sanctuary for disabled birds. There his journey takes on a new life experience. This is a wonderful breathtaking, beautiful Australian film. Amazing acting, a wonderful touching story that gives the viewer a thought provoking process of life, forgiveness, good and bad, and ultimate choices. It really shocks me that this movie has not got the shout out that it deserves, or the mention in the presses. This is a powerful under the radar film that I highly recommend for its ultimate beauty, storytelling, and passionate acting by all the individuals involved. Directed wonderfully by Craig Monahan. This is his third feature film, he has also directed a documentary. I will say it right now, and will defend my choice of making this comment, Craig is a true director. He is the very pivotal reality of what a great director is all about. If you have not seen Craig's 1998 The Interview or 2004's Peaches, I highly recommend you do so. All three of his feature films, star the wonderful and multi-talented Hugo Weaving. Most will know him for The Matrix trilogy, as Agent Smith. Hugo is a fantastic and extraordinary actor that has been acting since the 80's. There is a wonderful ensemble cast in this film, and I have to mention three that stand out, in award worthy performances. Don Hany, who plays your main lead character in this film, is one of those actors that always is able to grab you, and give you the emotional appeal, and the reality-based feel of the characters he plays. I have watched him for many years, and have always been fascinated and in total amazement at the brilliance, beauty, and emotional reality that he brings to films, and TV. The film Healing is no different. Next I have to mention, Xavier Samuel as the character Paul. Fantastic and very believable in his role. His performance is flawless. I have really grown fond of him, watching him lately. He has been in some amazing films, and his performance in this is equally brilliant. The third actor in this film that I think stands out, and is extraordinarily emotional, and leaves you the viewer satisfied with excellence, is Mark Leonard Winter. Another gifted actor. That is what is so strong about this film, all the actors, and actresses in this movie, leave a lasting impression on just how great the art-form of performing is. This is released on DVD by the wonderful company Anchor Bay. Aspect Ratio: 2.35:1 Widescreen Language: English (Dolby Digital 5.1). The sound quality and picture quality is absolutely breathtaking. This is a wonderful film in story, direction, and acting. I highly recommend this movie.